Thanksgiving is one of my favorite holidays, because is means we get to be with our family and share in all that we have to be thankful for! I am very thankful that I can bring this giveaway to you, my readers. Make sure to check out all the other great posts over at Modern Day Gramma. Thanksgiving is officially 22 days away! YUM! I can't wait to get the Butterball turkey and all the fixings. I look forward to some of the best food that I will eat during holidays (that's Thanksgiving and Christmas). The generous PR folks for Butterball have offered Life of a Busy Mommy readers a Butterball Turkey Giveaway! 1 of our fabulous readers have the chance to win a Butterball $20 gift check! Butterball is the only turkey for my family. We've tried other's years ago, but we've always gone back to Butterball. Those other turkey's just weren't as tender and juicy as a Butterball Turkey. I love the left over turkey, and I will make turkey sandwiches for days! My husband LOVES the HOT turkey sandwiches! Turkey, gravy, a little mayo on a roll or some bread. YUM! Oh and we can't forget the chips on the side. I'm getting hungry as I type LOL Come on 22 days! ;) Fun Fact: Did you know that Thanksgiving is the only major holiday without an emoji? Emoji's are suppose to spur excitement for the upcoming holiday, so this year, Emoji fans can visit Change.org to sign the petition and do their part to make the Thanksgiving emoji a reality. To help spread the word, the Turkey Talk-Line experts banded together to create a heartfelt appeal for signatures which can be found on Youtube, Facebook and Twitter. Butterball conducted its first-ever consumer survey this year and found that three in four Thanksgiving preparers agree: Thanksgiving doesn’t have to be perfect! As long as loved ones are together and the turkey is tasty, the festivities around it can be as imperfect as ever. Despite the overall positivity around the holiday, first-time millennial preparers are still feeling the pressure. Eight in 10 first-time cooks worry about cooking the turkey correctly. This number drops among experienced preparers, but still 43% worry about getting it right. Turkey Help: Although the Butterball Turkey Talk-Line experts have heard every turkey question possible, experts are making it easier to get cooking help this Thanksgiving by offering the ability to text cooking questions for the first time. Additionally, new video tips will help with all of your Thanksgiving needs. 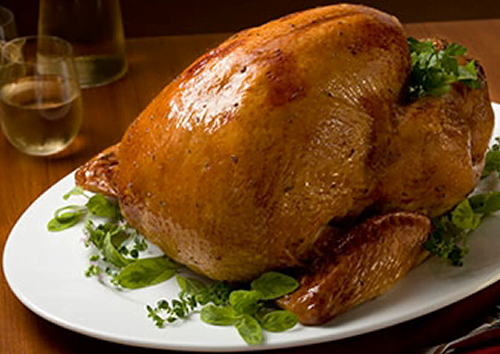 Week-long 24/7 Text Help: Whether you have years of experience or it’s your first time cooking the turkey, Butterball has all the answers you need. You can now text their Talk-Line experts at 844-877-3456, for all the insider tips to celebrate your perfectly imperfect day…no matter what the circumstances! Holiday cooking text help will be available starting Nov. 1, with extended hours starting the week of Thanksgiving. Plus, our Turkey thawing post tells you how long to defrost your turkey, so you don't end up with a turkey that is still FROZEN! Yep we've been there before, and trust me it's not funny at all when you have x amount of people coming and you have to hurry and finish defrosting the bird! LOL We are happy to offer this Butterball Turkey Giveaway! Here’s some of the things you need to know before you enter: 1 lucky winner will receive a $20 Butterball vouchers to use towards the purchase any ButterBall Products! Giveaway will run from 11/1 – 11//08 at 11:59 PM CST. This giveaway is open to US residents only. You must be 18+ to enter. Modern Day Gramma and Life of a Busy Mommy are NOT responsible if the winners email ends up in your spam mail folder. It is suggested that you include mediainfo@moderndaygramma.com to your contact list or check your spam folder on November 9th and 11th so you don’t loose out! Good luck and gobble gobble! Check their other Giveaways Here | Check out more Reviews HERE | Check out their Holiday Gift Guide Here. Family get together and have a huge meal! dinner with the fam with all the fixings! We all get together have a big meal of turkey and all the fixin's,sit around and talk and enjoy catching up with etch other. We love watching the Macy's parade on TV! One of our family traditions is to talk about one thing we are thankful for this year. It is always fun to hear what each person appreciated most. We always go to my mom's for a big meal. We buy our fresh Christmas tree that weekend! Eat here or at my daughter's house depending how my health is. We love to have dinner & then go black friday shopping together. We put the tree up the day after Thanksgiving. For the past several years I have been working but I am hoping to start a new tradition of having a huge family gathering with turkey and lots of other food with family and friends. We stay up late preparing dinner and get up early to watch the parades!! Visiting all the cousins and having dessert at each house. Our tradition is a huge meal with family and then we have game night. We always watch the Macy's Day parade while we are cooking Thanksgiving dinner. Most of the family shows up the day before so we can get everything prepped and ready for Thanksgiving morning. Then its a full day of cooking, eating, laughing and learning new recipes. We get together with extended family and have a big feast! We spend time together as a family. The last few years I have been doing most of the cooking but this year we will change that up some, and everyone is going to bring along their favorite dishes. I hope that this becomes our family tradition. I cook a huge meal and everyone comes here.